This is the best time of year for a variety of fruits and veggies, but few pack quite the powerhouse punch as the tiny blueberry. Blueberries contain polyphenols. Polyphenols are antioxidant and anti-inflammatory and can help protect against things like age-related cognitive decline, cancer, and cardiovascular disease. They are high in vitamin C, dietary fiber, and manganese. And – they are just 80 calories per cup. Blueberries aren’t just for dessert – toss some in your salad, make a blueberry barbecue sauce, or try some blueberry salsa over grilled chicken. You can even mix blueberries with orange juice, brown sugar, cinnamon, and sour cream to make bisque – check out more recipes from the US Highbush Blueberry Council. You can head to the farmer’s market or local grocery store and stock up – or you can add a touch of beauty to your apartment patio or balcony and grow some blueberries in containers. There are hybrid varieties available that are ideal for patios because they are compact and can grow in a container. Put some broken clay bits in the bottom of a very large pot, then fill it half full with soil. Blueberries like acidity, so be sure to look for a potting soil with a lower pH (right around 5.5). You can also add peat moss or sulfur to your potting mix. Now, add your blueberry plant. You want it about the same depth as the original container, so add or remove soil until it sits at the right height. Fill in with more potting soil, stopping a couple of inches from the rim. 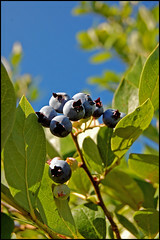 Place your blueberry plant in full sun – a spot that gets between six and eight hours of sunlight. If possible, collect rainwater and use that daily on your blueberry plant. It contains more acid than tap water and is better for the plant. Be sure to add fertilizer, following the instructions as to the amount and when to reapply. You can add some mulch after potting your blueberry plant to help it retain moisture. After the plant matures, you’ll want to prune any branches that rub against other branches. This provides air circulation and prevents diseases from developing. You won’t have major pest concerns, but birds love blueberries — if necessary, protect your blueberry plant with netting when the blueberries are becoming ripe. Don’t expect to pot up your blueberry plant today and have blueberries tomorrow or even in a few weeks – it takes about two years for a young plant to begin producing fruit. But, if you are patient now, once your plant starts producing fruit it could do so for 15 to 20 years. Pick the darkest blueberries every five days or so, and start creating those blueberry pies, scones, salsas, and smoothies!